Petro chemical hose provides strength and protection when used for connections between sump/pump and tank manway applications. They are ideally suited where pipe work has the need of a direction change as well as providing improved installation, misalignment correct and vibration elimination. Petro chemical hoses are generally used for forecourt dispenser connections, riser pipes, pumping units and as pressure or suction lines on forecourts. Hydraquip’s knowledgeable design team have a wealth of industry experience who can provide a design service for OEM’s with the addition of awareness of historical spares for the forecourt sector. Hydraquip’s Caterquip range are ully welded corrugated stainless steel catering gas hose assemblies manufactured to a high specification in order to meet the legal requirements of gas supply in catering appliances using first, second and third family gases. The hoses come with a quick-release valved coupler which cuts off the gas supply when disconnected. This special coupler must be installed in accordance with BS6173-1990 standard for mobile catering units, with the restraining device supplied. The restraining device meets the required minimum tensile load specification as per BS 669 Part:2 1997. Hydraquip’s range of metal building services hoses are manufactured with a single wire braid over a convoluted stainless steel core with a range of either mild/carbon or stainless steel fittings secured by stainless steel weld collars. Unbraided and double braided versions are also available for lower or higher working pressure applications. This hose range is ideal for installations which require and longer life expectancy as they are able to withstand extreme working parameters, exceeding that of standard rubber hoses. 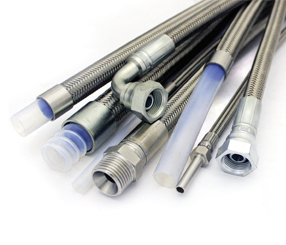 Assemblies are manufactured in lengths to meet the requirements of individual projects with loose hose and fittings held in stock to meet these needs along with a selection of off the shelf standard hose assemblies. As an expansion of Hydraquip’s Metal Hose Division in Bolton, Hydraquip Northampton was opened as an additional manufacturing facility with the capabilities to manufacture a full range of Stainless Steel & PTFE hose assemblies. The staff at Hydraquip Northampton bring an additional 130+ years of collective experience to the group, increasing the technical knowledge and skill set of the whole team. 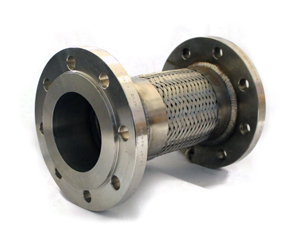 Hose assemblies from 1/4″ to 12″ NB are manufactured and supplied for applications such as water, oils, chemicals, air, steam, gases plus high and low temperature hose applications. Large volumes of bulk hose and fittings are also available ex stock on short lead times. The range of Stainless Steel hose assemblies manufactured at Hydraquip within the Metal hose division include Stainless Steel Building Services Hose, Catering Gas Hose, Metal Hose for OEM, Petro Chemical, Ultra High Vacuum, Stainless Steel Bellows, Gas Hose and Solar Hose & Fittings, as well as made to measure hose assemblies to suit individual customer requirements around the globe.